Wheeling’s Casey Wilson leads team in Spaceport America Cup in N.M.
Photo provided West Virginia University Experimental Rocketry team members are, from left, Casey Wilson; Zach Maddams; Tucker Johnson; Gene Cilento, dean of WVU’s Statler College of Engineering; Matt Hines and Dan Bennett. MORGANTOWN — West Virginia University’s Experimental Rocket team, led by Wheeling native Casey Wilson, overcame near catastrophic setbacks to capture second place in the 10,000-foot-launch category at the second annual Spaceport America Cup. 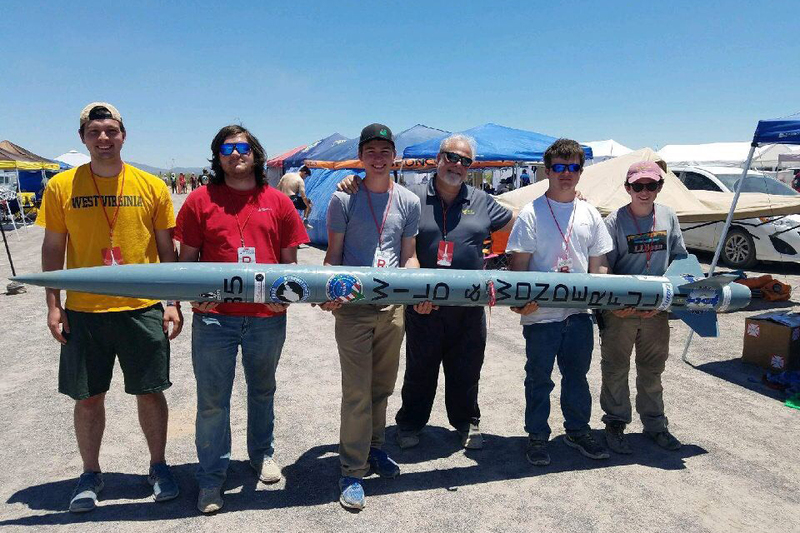 The event, held June 19-23 in New Mexico, showcased student rocketry teams from all over the world to launch solid, liquid and hybrid rockets to target altitudes of 10,000 and 30,000 feet while carrying a minimum of 8.8 pounds of payload. After finishing first in the 10,000-foot category during the 2017 competition, the WVU team was excited to defend its title and also to compete in both event categories for the first time. WVU will once again send two teams to the competition next year in hopes of redeeming themselves in the 30,000-foot category. Team members joining Wilson and Bennett in New Mexico were mechanical and aerospace engineering majors Matt Hines of New York, Tucker Johnson of Virginia, Zach Maddams of Delaware and Abadi Albeladi, Saudi Arabia.